Uttar Pradesh Subordinate Service Selection Commission (UPSSSC) had invited online applications from 20th February 2015 to 16th March 2015 against latest notification advertisement no. 3-Exam/2014-15 on 12th February 2015 for 3764 posts of Junior Assistants Pay Band Rs. 5200-20200/- Grade Pay Rs. 2000/- in 24 departments. The last date for payment of application fee was 18th March 2015. The Final date of submission of online application was 23rd March 2015. The final selection of the candidates will be based Merit List on the basis of Performance in Written Examination which is going to be held on 31st May 2015 from 10:00 AM to 11:00 AM at various centres i.e. Agra, Allahabad, Ajamgarh, Bareli, Itawa, Faizabad, Gorakhpur, Ghaziabad, Jainipur, Jhansi, Kanpur, Lakhnow, Meerut, Muradabad, Raibareli, Sararinur, Sitapur, Varanasi, Manuri, Mathura, Barabanki, Ramipur and Bulandsahar. The written Exam will be consisted of 50 Marks, Computer Proficiency Test (25 marks) and Personal Interview (25 Marks). The latest news is that UPSSSC has released online admit cards on 10th May 2015 on official website. Those candidates who had applied for these posts and waiting for their admit cards, they can download their UPSSSC Jr. Assistant admit cards from the direct link provided below. · Click on the link say Exam Admit cards. 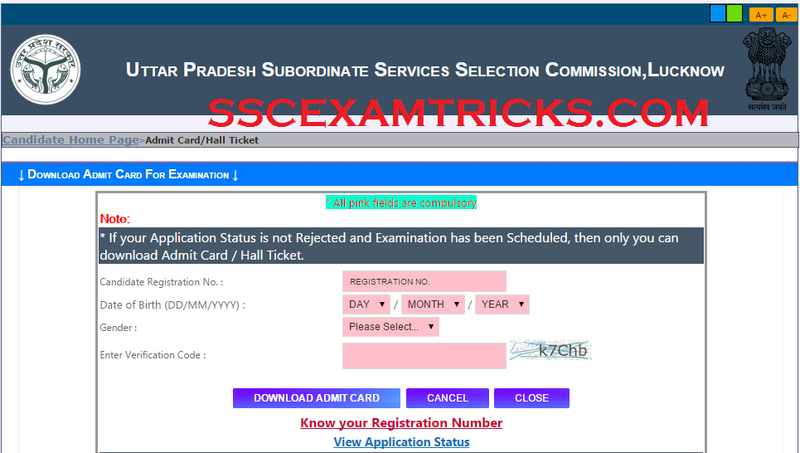 · Download UPSSSC Jr. Assistant Exam Admit Card. UPSSSC Exam 2015 will be conducted on 31st May 2015. The Written Exam will be conducted by Pen MODE. The OMR sheet will be filled by Blue/Black ball point pen. The questions will be asked from General English, General Knowledge, General Hindi, General Math and General Interest. In this paper a total of 50 multiple choice questions (MCQ) each of one mark will be given and four options will be provided out of which candidates need to choose one correct answer. Total marks for exam will be 40 marks. The time duration for exam will be 1 hour or 60 minutes. A Merit list will be prepared based on the performance in written examination. A ten times more than requirement of the candidates will be called for next stage which will be interview of the candidates.